a primitive dun-colored pony with a dark dorsal stripe and zebra markings on the legs, 12.1 to 14 hands high. Called also Mongolian wild horse. Meanwhile, the researchers are gleaning information about horse domestication by identifying genes that differ among domestic horses, Przewalski's horses and the fossils. Although held in captivity in many zoos around the world, Przewalski's horse has never been effectively tamed or domesticated. The last reliable sighting of Przewalski's horse in the wild dates back to the late 1960s. Still in the planning stages is a fifth major exhibit, the Siberian Steppes, for the endangered Przewalski's horses, the Siberian saiga, and other species from that region. It is not only related to the follow-up management and protection, but also can accumulate the basic data on the restoration of "wild character", which can also provide the important scientific basis for a guidance of the Przewalski's horse reintroduction. 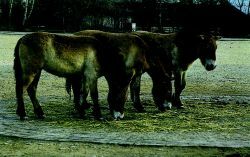 Either ancestral horses had extra chromosomes, as Przewalski's horse does, which later fused to form a single chromosome in the domestic horse, or ancestral horses had a big, domestic-looking chromosome that later broke to make the Przewalski's extra chromosomes, Wade says. Przewalski's horse, or Mongolian wild horse, is the only true remaining species of wild horse. Zoos are returning other species to their native habitats too: the scimitar-horned oryx (similar to an antelope), Przewalski's horses (an endangered species of wild horse), a kind of monkey called the golden lion tamarin, and California condors, just to name a few. In Przewalski's horses when estimated from whole mtDNA resulted 0. Roaming concrete streets overtaken by forest, were a pack of wolves (seen by a visiting photographic crew), a small herd of Przewalski's horses released in the area in 1998 and giant catfish prospering in the fishing-free waters of the Pripyat River. After the massacre of her family and most of her town at the hands of Nazi soldiers, she finds temporary comfort at a wildlife preserve when her path crosses with a pair of Przewalski's horses, wild horses whose entire pack was slaughtered by the same Nazi soldiers. After a successful reintroduction, 306 Przewalski's horses now live in Mongolia.